it was in early july that i told her i'd just seen a *huge* fern - i don't remember the overall reason for our correspondence at the time, but i do remember that when i told norma about the fern she was, well, norma... she responded to my excitement as if she herself had seen the giant fern! we wrote back and forth about it three or four times! now, exactly one month later, it seems like lifetimes ago that i came across that fern on one of my wanders. 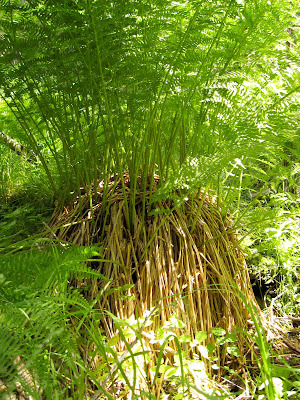 here it is in all of its fern glory (not that my picture even begins to capture it); if i were standing next to it we'd be about the same height - a little over five feet tall. 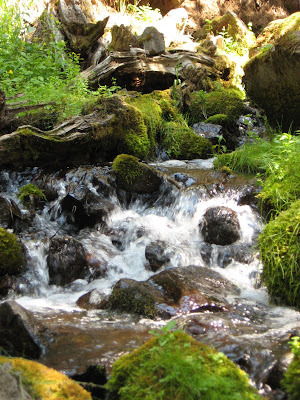 i found it one day when i was walking up this stream, which is one of the headwater streams of the creek that i live on. we have a lot of water here - and a lot of mossy rocks like the ones in this pic, but because the relative humidity is so low there are very few ferns. there are some, but they're not very tall or robust. this is, after all, considered to be high desert. 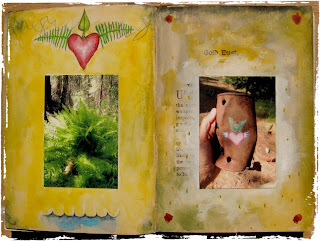 the 'fern pages' in my daily book. i drew on the can here at home and took it back to leave at the fern a couple of days later. the deer flies were way too intense there to sit and draw. You ever hear that song "Happiness is two kinds of ice cream..."? Well happiness is two kinds of ferns...great big 5 foot tall ones and tiny ones drawn by you, Lynne. I love that first sketch. And now I wish to go hop in a stream. 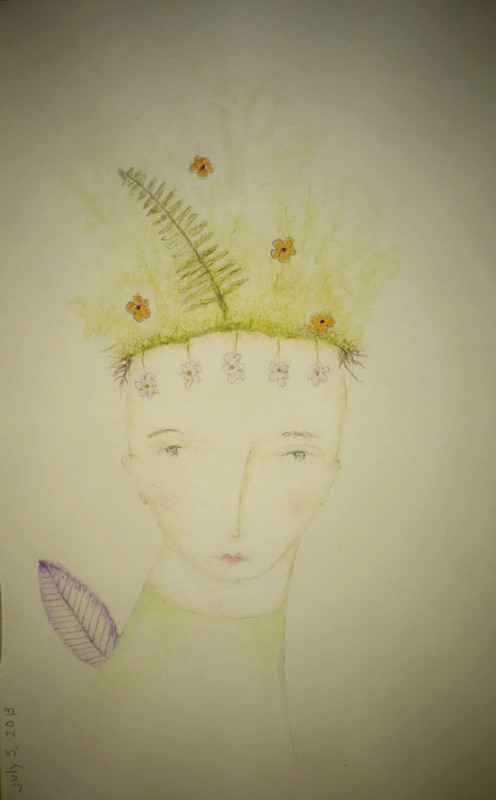 Oh how delightful is your fern lady - and the real fern that inspired this whole fern challenge is so majestic! Two beautiful creations! You certainly do live in a lovely place Lynne and the beauty of it all is you can wander safely on your own. Your fern lady captures your whimsical spirit (I love her! )and your joy at discovering the giant fern is contagious. I love ferns and this one look spectacular! I have several species in my yard at least 6 and several are native. Nature is so incredible, isn't it? 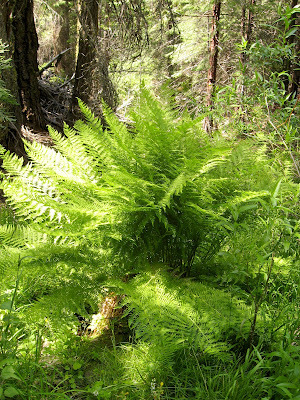 Oh my, it would be truly magical to stumble upon that beautiful fern. 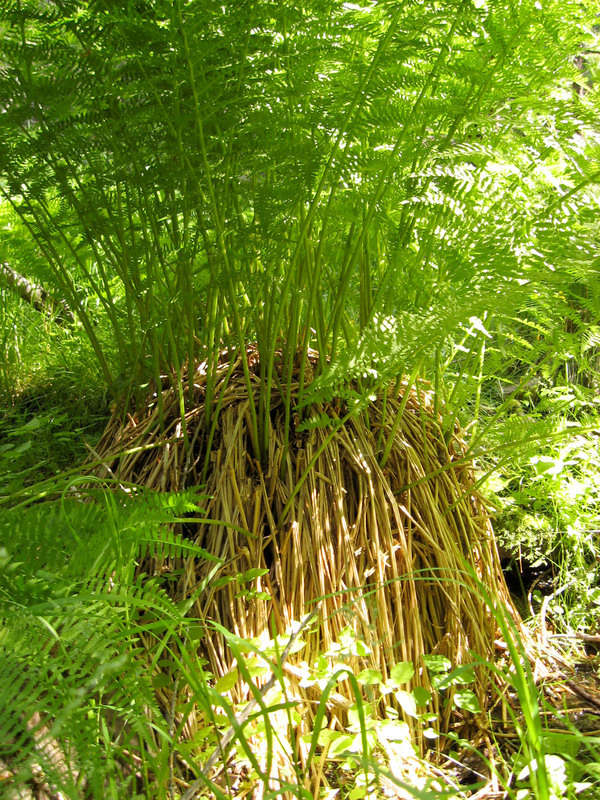 We have lots of ferns all around us, but never have I ever seen one so magical. Truly breathtaking, indeed. I love visiting your blog and hearing about your beautiful journeys. Nature is so special, and it is so wonderful to be reminded of that reading your blog. Thank you! your story is just as exciting as is your illustration. fern on one's mind, like this a-one,.... yeah. i'm so happy with my own fern in my garden, to have reacquainted with it just yesterday, this challenge in mind too. That is a WHOPPER of a fern. And so beautiful too. 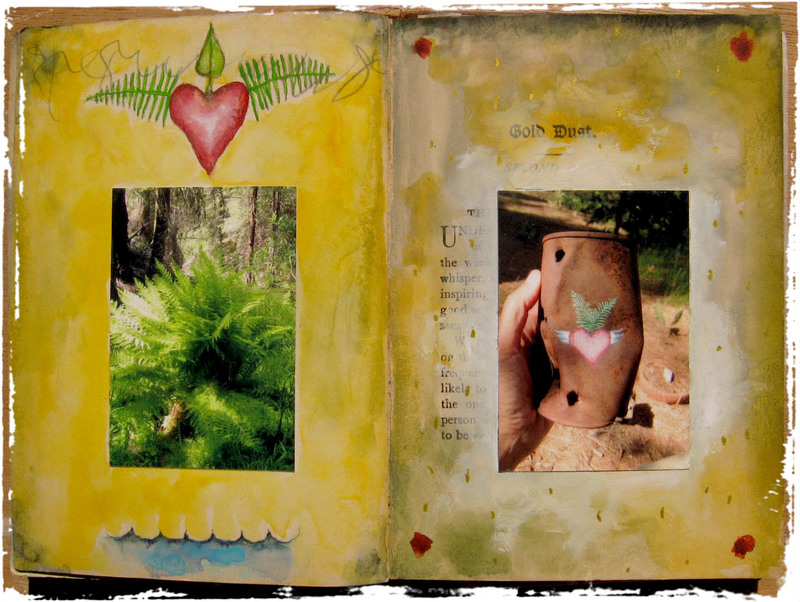 I love your fern lady and the peek into your daily book. Wonderful homage to such an impressive plant. Little sidenote - I was so chuffed to see this post pop up in my sidebar as I have been out in my shed doing your face tutorial all morning I was going to post on that thread 'thank you' but I'll say it here instead. Thank you. Such a generous tutorial and though my face came out a little more stern than intended, I learnt so much and will be able to incorporate the techniques in future. Wow though, you must go through buckets of white gouache! I need to invest in more - they've sat on my shelf unloved all this time but I love the effect! Lynne, That is indeed a wondrous fern!! We don't have them here at all. Lucky duck. And what a wondrous stream as well! I can imagine the quiet excitement finding that glorious fern Lynne! It is grand indeed. Unexpected beauty. Love your daily book pages. just delightful - I discovered a small fern growing in my garden yesterday and I am now tending it with care! we share a love for fern ladies!!! I do so love that fern too, how fabulous, I wonder how old it is... We don't have such huge ferns here, the wind batters them as it swirls in from the sea, you are surrounded by such beauty and your work really reflects this. loved the story Lynne and Fern is just as tender and lovely as the story. Your photos are gorgeous and for just a few brief moments I got lost in your corner of the world. Lynne, Fern is lovely and delicate, just like her namesake. I totally understand your wonderment at that huge fern; I've seen some pretty big ferns in forests south of here, but I don't think I've ever seen one 5 feet tall! do you happen to know what kind it is? It looks similar to ones that grow around here, but they're not that large, and KY has to be the humidity capital of the U.S. Just my usual curiosity, I guess. Ferns are some of my favorite plants. I think it has to do with growing up in south Texas, where, as you can imagine, there were ZERO ferns. I always associated them with magical places I'd seen in movies like The Dark Crystal and the like. Some are teeny-tiny (I had one planted in a sake cup for a while) and others are quite large. They make me happy! Wow. Seemed a luminous experience. I thought/ think Fern accepted a " meeting" spirit to spirit with the beautiful woman who understands. The forest loves ur care and joy. I feel this. Thinking of u and the beloved earth, forest, streams during the blaze. Just wanted to stop by to say hello. You must be enjoying the last days of summer! Hope to see new stuff soon. Miss your paintings, miss your stories.